Sativa plants are known for being tall with long leafs. When smoked, they produce a cerebral high thanks to dozens of compounds called terpenes (see sidebar). Indica plants are known for being stout and short with dense, compact buds. These are known for a stoned high, also due to terpenes. Not sure about the difference between terpenes and cannabinoids? Cannabis expert Max Montrose from Denver’s Trichome Institute explains some of the essentials. 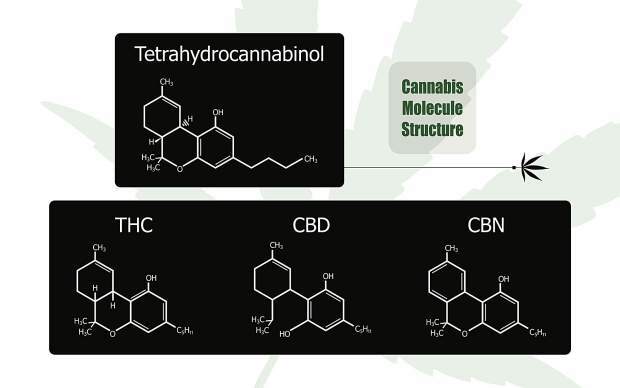 Cannabinoids: One of three compounds found in cannabis, these chemicals determine the intensity of any psychoactive high. The two most common are THC (Tetrahydrocannabinol) and CBD (Cannabidiol). There are 60 to 100 different cannabinoids in any single cannabis strain. Terpenes: These might not be the most well-known compounds in cannabis, but they’re easily the most psychoactively important. Terpenes largely determine the type of high users experience, from stoned to euphoric. There are 30,000 known terpenes in the world, with 200+ that are common in cannabis. These also help determine the smell, like D-Lemonene in fresh, citrusy strains. Flavonoids: The final compound in cannabis is found in almost every fruit and vegetable on the planet. These chemicals give plants color. Unlike terpenes and cannabinoids, there are only about 12 flavonoids. Shatter: A concentrated THC extract from cannabis plants with a clear appearance and thin, brittle texture. Most manufacturers use the “sugar trim” (trichome-rich leafs trimmed off the bud) and extract the THC by processing it with butane or other chemical or non-chemical solvents, like butane and carbon dioxide. The end result is a powerful marijuana product of up to 80-96 percent THC, compared to 20-25 percent for most raw flower. Wax: Another concentrated THC extract from cannabis plants, this one with an opaque color and sticky texture. Wax is a combination of THC and plant waxes, such as paraphin and cutin. At Bolder Extracts in Boulder, wax is made by “whipping” batches of shatter. Live resin: A relatively new extracting process that replaces dried and cured bud with “fresh frozen” bud, meaning manufacturers freeze the plant and then process it as usual. The idea, according to Spencer Uniss of Bolder Extracts, is to protect terpenes typically lost when drying and curing for a smoother, brighter high. Terp juice: Also known as terp sauce, these extracts are high in terpenes and can produce a different, more intense high than traditional shatter or wax (which are pretty intense in the first place). Sources: Trichome Institute; Bolder Extracts. Ask Max Montrose why a classic sativa strain like Sour Diesel really isn’t a sativa, and the longtime cannabis advocate starts talking agriculture, genetics and poodles. “Dogs and cannabis are two things that our species has cultivated in a really serious way for tens of thousands of years,” began Montrose, cofounder of Denver’s Trichome Institute, when we spoke just two weeks shy of 4/20. The former budtender, who now hosts “weed sommelier” courses to train dispensary employees from across the state, is an avid proponent of cannabis education. His Trichome sommelier courses cover everything a pot expert needs to actually be an expert, from the dangers of bud rot to the difference between terpenes and cannabinoids. And like any good teacher, his metaphor for the reason why sativas aren’t sativas is pretty convincing. I’d never considered how millennia of pot cultivation shaped the modern cannabis industry’s two staple strains, but as Montrose told me before anything else, there is plenty of misinformation about the plant and its effects. That’s just the nature of a previously illegal drug. Misinformation might be the norm right now, but the cannabis industry is slowly maturing after four years of legalization in Colorado. Following the 2016 election, 29 states had legalized cannabis in one form or another and seven had fully decriminalized it, opening the doors for dozens of products: wax, shatter, tinctures and edibles, all of which require very serious, very expensive equipment to safely produce. And manufacturers are willing to front the cash. At the same time legal users are demanding more (and more interesting) ways to consume; legitimate analysis of cannabis by grant-funded scientists has taken off. The marijuana research lab at the University of Mississippi — once the only American university to study cannabis — is now joined by institutions across the world, including Oxford University and the University of Colorado’s Anschutz Medical Campus, both of which are looking at medical marijuana. Testing labs like RM3 Labs of Boulder, Agricor Laboratories in Denver and TEQ Analytical Labs (located on the Anschutz Campus) have long analyzed dispensary strains for required information like THC and CBD content, while Montrose at Trichome wants to bring a more elegant and less clinical understanding to the plant. Why, then, does Montrose claim Sour Diesel isn’t a sativa? It comes down to the species name. In general, according to most off-the-Internet guidebooks, cannabis is split into two species: sativa and indica. Sativa plants are known for being tall with long leafs. When smoked, they produce a cerebral high thanks to dozens of compounds called terpenes. Indica plants are known for being stout and short with dense, compact buds. These are known for a stoned high, also due to terpenes. True, Montrose said, but it’s only a half-truth. Every cannabis strain sold at a recreational dispensary is actually indica, he continued, while true sativas genotypically and chemotypically “hemp” — a member of the cannabis family with no psychoactive properties. Recent science is showing us that both narrow-leaf drug types (“NLDs”) and broad-leaf drug types (“BLDs”) have way more indica DNA than the narrow-leaf hemp types. They come in two forms: indica Afghanica, which looks like a layman’s indica, and indica indica, which looks deceptively similar to sativa. Montrose is one of the few who doesn’t just read the technical textbooks — he writes them. Trichome’s multi-part educational series, known as the National Cannabis Industry Textbook, takes what the cofounder has learned about the plant and puts it together in one place. His goal: to bring respectability and reliability to a young, previously illegal industry. “The number one problem the cannabis industry faces, more than taxation and prohibition, is education,” Montrose said. Trichome’s textbook series is also the framework for its sommelier courses, which Montrose hopes will one day be taken as seriously as becoming a wine sommelier. But where does something like dabbing fit into a connoisseur experience? Dabbing is the overarching term for smoking wax or shatter, two of the most popular cannabis concentrates. These substances can be 85 percent THC or higher, with some from Breck Organic testing as high as 96 percent THC. That concentration makes for an intense high — waxes and shatters are melted and smoked with special devices — but it can also be dangerous, Montrose said. As he explained to a sommelier group in a 2016 Westword magazine article, any pesticide or other contaminant left on a plant when it’s processed is magnified, just like the concentrated THC. It’s a problem manufacturers like Uniss at Bolder Extracts solved early on. The company grows all of the raw plant material that goes into its extracts, meaning Uniss and his partners know the age, potency and grow cycle of all genetics (aka strains) used for Bolder Extracts shatter. Where does science take the industry next? Uniss is seeing more R&D with terpenes and cannabinoids, while Montrose wants to keep bringing legitimacy through education. This article originally appeared in the Rocky Mountain Marijuana magazine.